Following their selection on 16 January 1978,3 the thirty-five members of Group 8 underwent a two-year (later amended to one year) Astronaut Candidate training programme beginning in July, which would qualify them for technical assignments leading to selection to a Shuttle flight crew. The pool of astronauts from which a Shuttle crew (between five and seven persons) could be selected had now increased, and the scientist-astronauts still awaiting their first missions were now hoping that NASA's projected flight rate would be met. They wanted to be assigned to early seats before the queue became too long! On 26 July 1978, Joe Allen returned to the CB as a senior scientist-astronaut from his position as Director of Legislative Affairs at NASA HQ in Washington.4 He arrived back at the CB one day ahead of the new astronauts, as he did not wish to be considered "junior" to them by arriving later, even though he had been an astronaut for almost eleven years by then. Allen gave a little talk to the new group, joking that he had had some problems being an astronaut candidate and had been banished to NASA HQ for three years. He warned them to ensure this did not happen to them. But no one in the group of new astronauts laughed at all, assuming he was being serious and that if they messed up, they too would be banished. They seemed worried about exactly what Allen had done to warrant such a sentence.5 Allen had informed the friends he had made in Washington that "It had been a very interesting and quite enjoyable three years,'' not letting on that he considered his NASA assignment to have been the "worst headache in the world.'' He also told his friends and colleagues on Capitol Hill that he wanted a less stressful line of work, and was returning to the astronaut office to prepare to fly into space. After all, the potential for high blood pressure and heart attacks would surely be more worrying than sitting on a Shuttle and being blasted off the launch pad! 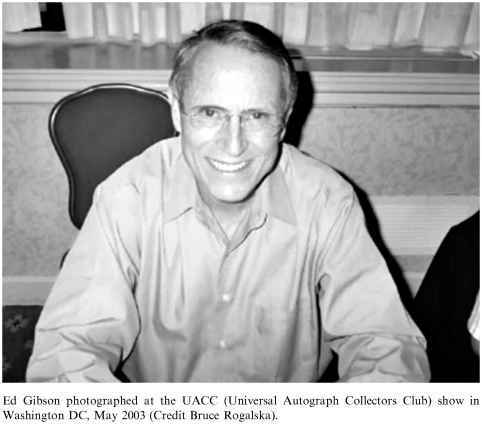 Ed Gibson photographed at the UACC (Universal Autograph Collectors Club) show in Washington DC, May 2003 (Credit Bruce Rogalska). mission as mission specialists (MS), and would work with the European and American payload specialist (PS) candidates on the Spacelab 1 science programme and crew activity plan. Six days later, on 9 August 1978, the four Spacelab 2 PS candidates were named. 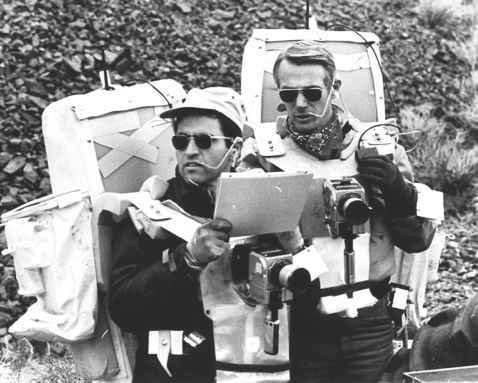 Some years later, Chris Kraft mentioned that he had suggested saving money by halting the PS programme for Spacelab missions and instead utilising mission specialists, who could draw upon their career astronaut training and could perform many of the tasks assigned to the payload specialists.6 This argument would continue for several years, especially when the PS programme was opened up to non-scientist candidates for missions other than Spacelab science research missions. The following February (1979), USAF Under Secretary Dr. Hans Mark initiated the Manned Spaceflight Engineer (MSE) Program, in which military payload specialists would be trained to accompany Department of Defense (DoD) satellites and payloads on classified Shuttle missions. Contrary to Kraft's suggestion, the pool of payload specialists was clearly about to expand, squeezing the number of seats available to NASA's astronauts on the Shuttle each year. payload development issues. For the two former scientist-astronauts (England and Ed Gibson) returning to NASA with the imminent launch of the Shuttle flight programme, the prospect of finally reaching orbit must have seemed brighter than it had only a few years before. In October 1979, Don Holmquest wrote a letter to George Abbey also asking to return to the CB as a senior scientist-astronaut, recognising that mistakes had been made on his first astronaut tour. He did not return, however, and it was clear that not all the former scientist-astronauts would be required for the Shuttle. The only other astronaut to return to the agency after retirement was Group 5 pilot-astronaut Bill Pogue (Skylab 4). Pogue had retired in 1975, but returned in 1976 as a consultant on programmes to study the Earth from space. He departed the space agency a second time in 1977. By 1980, the Shuttle had still not orbited the Earth and it seemed that the inaugural flights would still be months away, pushing the operational flights further into the mid-1980s. NASA planning documents of the time included crew planning charts, evaluating the manpower requirement over the coming few years. When Shuttle flights exceeded twenty launches per year, crews would be recycled intact within a year of flying a mission, to both shorten training time and to take advantage of their experience of working together as a unit. These manifests, showing the proposed twenty-six missions a year (a flight every two weeks using both the Kennedy Space Center in Florida and Vandenberg AFB in California), would require at least twenty-six crews of between five and seven NASA personnel, depending on the mission. That would mean having an astronaut corps of between 130 and 190, all trained and ready to fly at least once a year. At the time, NASA had twenty-seven astronauts from the 1959-69 selections, and thirty-five in training from the recent 1978 selection - sixty-two in all - only a third of what was indicated in the planning charts.